How a mommy date with my son turned into a Mother's Day outfit idea! A funny thing happened when I took my son to Au Fudge last weekend for a special “MommyAndMe—Create Salon” hosted by LA-based clothing company Kut from the Kloth. During the week leading to the event, I shared with Benny that he would be having an opportunity to design a denim jacket for mama. Benny said he was going to decorate my jacket with glitter and purple colors and butterflies and sprinkles— basically everything he figured I’d like to hear. Details from the "MommyAndMe-- Create Salon" hosted by Kut from the Kloth at Au Fudge. The unique Kut from the Kloth event was an opportunity for kids to interact with one another and spend a lovely afternoon designing a gift for mom. There were goodies and desserts and a book reading by Sara Aspinall. There were also several jackets for moms to choose from, something which opened my eyes to the company, whose clothing items I’ve often seen at large department stores like Nordstrom and Macy’s but never tried. Kut from the Kloth offers a unique reward program called "Your Style Rewards". It's how the company rewards its customers for shopping and sharing their Kut from the Kloth items on social media. The way it works is, you become a member by creating an account on the company's website. You refer friends, post product reviews and share on your social media channels in order to gain points. For every 2,500 points earned, you get a $15 discount on your next order! They have adorable dresses and tops and their jeans come in all different cuts and styles. Thanks for reading and Happy Mother's Day! We're bringing our excitement of the live-action film to the table! We love the tale as old as time and since we're days away from the box office opening of the live-action film starring Emma Watson and Dan Stevens, we're feeling excited and inspired! When I found out my cousin would Be Our Guest this weekend (she's in town from Mexico), I felt inclined to make our lunch date at my house extra enchanting. A few years ago, I had a Beauty and the Beast-inspired breakfast with Benny but this weekend's warm and lovely weather called for an outdoor soireé. I have plenty of antiques and Disney collectible items, plus, Benny has a Beast costume. Even better, one of my nieces made her own Belle dress for Halloween last year so I asked her to bring it over! Our lunch didn't include French delicacies such as "beef ragout, cheese souffle, pie and pudding em flambé!". It was much more simple than that but tasty and a worthwile experience. Our menu included Cogsworth croissant sandwiches, enchanted rose strawberries and even vanilla pudding "gray stuff"! Here are more pictures of our Beauty and the Beast-inspired lunch. Nos encanta la película de la Bella y la Bestia. Y es que estamos a unos días de la apertura de la fabula ancestral de acción en vivo protagonizada por Emma Watson y Dan Stevens. Con motivo de la nueva cinta y al enterarme que mi prima estaría de visita este fin de semana (vino de Querétaro con su hija), decidí hacer algo asi como un festín. Tengo antigüedades y artículos de colección de Disney, además, Benny tiene un traje de la bestia. Incluso una de mis sobrinas hizo su propio vestido de Bella para Halloween el año pasado así que le pedí que lo trajera! Nuestro almuerzo no incluyó delicias francesas como ragu, soufflé tarta y pudín em flambé. Fue muy sencillo pero agradable y memorable. Tuvimos sándwiches de croissants a la Cogsworth, fresas picadas para aparentar rosas encantadas e incluso pudín de vainilla que pareciera higado de pato, como en la película original! Benny en su papel de la Bestia se portó muy informal ... ¡No esperó a que Bella se le sirviera antes de dar la primera mordida de su sándwich! Pasamos un rato verdaderamente encantador. Will you be watching the movie on opening night? Feel free to share any small or beastly plans you may have! Thanks for reading! ¡Gracias por leer! Ways to Repurpose Halloween Costumes! Costumes shouldn't be limited to a single day use! Buzz Lightyear Should Return Year-Round! Halloween is so much fun, isn't it? But it's over in a blink of an eye! In 2016, it was reported by the National Retail Federation that people spent over $8 billion dollars on Halloween, with the most amount of money ($3.5 Billion) going to Halloween costumes. With so many adorable options and the boys growing so fast, I couldn't help myself. Is it possible that their costumes will only be good for one month of the year? What can I do to maximize their costume fun outside of trick-or-treating? And, what's a creative way to justify the expense that will almost certainly be acquired again next year? So I decided it was time to get creative and schedule some play dates. It all took place in a planet far, far away named...my backyard! And all the space heroes going around made this morning too fun for us mommies who were standing by in case of a meteor meltdown! I placed all the Buzz Lightyears from around the house in different areas of the yard and their mission, among others was to escape the "asteroid ghosts". The pretend spaceship skeleton was from Benny's 2nd birthday and was made out of PVC pipe. 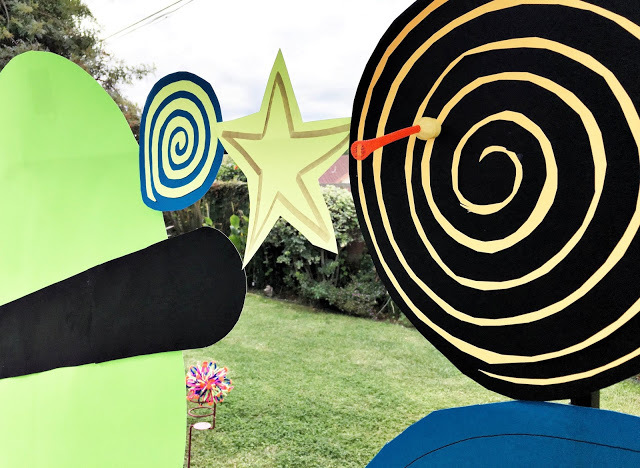 I also turned a regular dart board into a space target, trying to mimic scenes from the Buzz Lightyear Astro Blasters ride at Disneyland. You should definitely try this at home... It's not too complicated and it's the kind of stuff memories are made of! The Buzz Lightyear costumes will probably come out of the box a few more times...and they'll be transported to Infinity and Beyond! A Fun Place to Brunch with your Airplane-Lovin' Kids! The Waypoint Cafe in Camarillo is a place where you can fly-in for breakfast (I'm not kidding-- there are even pilot instructions on the restaurant's website). It's located adjacent to the small Camarillo Airport in Ventura County, CA. The place is close enough to LA to make a morning trip and enjoy good food and drinks, while your kids run on a pretend runway and watch real Cessna Jets land and takeoff! We spent Father's Day morning at the Waypoint Cafe with my husband, my dad and my dear uncle Rafael. We hung out in the cafe's backyard overlooking the planes as Benny ran with new buddies whose parents were also waiting to be buzzed to their tables. The ladies enjoyed pineapple mimosas while the men had 805 Beer, which was pretty appropriate considering Camarillo's area code is *805*. Once inside I went with the Berry French Toast, because...why not! My sister ordered a veggie omelet with fruit and we shared-- both plates were awesome! Benny colored on airplane-themed placemats waiting for his small order of pancakes. The mood was very chill, reminiscent of a beach restaurant. Oh wait, the Oxnard beach is only a few miles away...fun. But honestly, The Waypoint Cafe nice little place to spend a weekend morning. If you don't believe me, just ask Benny. My son Benjamin turned three in December. We celebrated his birthday at Walt Disney World. Before that, we celebrated almost every accomplishment, milestone and cute thing he did with tons of attention, cheers, outings and gifts. He was the light of our lives-- our first child, the only grandchild on both sides of the family and my inspiration for so many things (including this blog). But as of three weeks ago, Benny has a baby brother named Tobias. Throughout my second pregnancy, we explained to Benny that he would soon become a big brother. We read books for him on the topic and explained that our family would be growing into a family of four. We hyped the arrival of Toby and frequently reminded Benny that his baby brother would eventually become his best buddy. On the day Toby was born, Benny had a "Big Brother gift" waiting for him at the hospital. He was so endeared by his baby brother that day that he sung a lullaby for him, in front of all of us, in my hospital room. The cuteness and innocence of that moment practically had us all in tears! But then came the time to bring our newborn home. And that's when sibling rivalry took over! Benny is a sweet boy and we always knew he'd be nice to Baby Toby. What was interesting though was seeing him go from giving his little brother soft pats and kisses to ignoring him altogether! During the first two weeks, if we asked him questions about Baby Toby, Benny would ignore us or change the subject. He started pretending to be an infant and would try going inside Toby's bassinet and ask for breastmilk. He was very sentimental and desperate for attention. It was as though he loved Toby but felt a lot of jealousy at the same time (which I've read is quite normal). But now that Toby is almost a month old, Benny has apparently come to terms with the reality that he is not the only child at home anymore. He talks to Toby a lot and recently asked me: "Mama, when can I play with Toby?" Suddenly it occurred to me that toddlers need a "play" connection to feel close to other kids. So I put on my thinking cap and figured out a few ways to get my toddler to "play" with my newborn! This is the first of three activities I will share to demonstrate how we made it happen. I must say, this was the most fun and laughs we've had in a long time (Hooray for Maternity Leave)! Note: these play activities require adult supervision. AT. ALL. TIMES. I started out by creating a pretend doctor's office. In this activity, Benny was the pediatrician and I took my baby to see the doctor because he was showing symptoms of drinking too much milk...LOL. I printed and framed a few graphics and gathered all of Benny's doctor toys. During the consultation, I explained to Dr. Benny that Baby Toby needed a check-up because he's always hungry! Benny said: "Ok, let's put him on the bed"
In the middle of the consultation, Toby started crying and Dr. Benny turned around and asked him to keep it quiet. "Shhhhhhhh," he said. The doctor visit lasted quite a while, but fortunately, everything checked out fine in the end.... (hilarious). Thanks for reading... Stay tuned for Part II our Toddler-Newborn play activities!